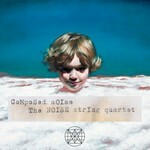 Composed noise / The NOISE string quartet. Instrumentation: Strings, percussion and tape. 10 Mar 2018: at Ruthless Jabiru and Morgan Pearse // The Drowners (King's College Chapel (London)). Featuring Ruthless Jabiru, Kelly Lovelady. 8 Oct 2013: at Composed NOISE (Cell Block Theatre). Featuring The NOISE.